A bit of garlic and lemon juice—along with plenty of fresh mint—turns yogurt into a delicious, healthful salad dressing in a matter of minutes. It's so easy and delicious that you may well find yourself why anyone would ever buy a pre-made bottled version. As lovely as this Yogurt Mint Salad Dressing is on a salad, know that it works equally well as a dip for fresh vegetables like carrots, celery, broccoli and/or cauliflower florets, fennel, and radishes. Or use it as a sauce and drizzle it on slices of cool cucumbers or crunchy peeled kohlrabi. It also works as a sauce on cold fish (it is particularly tasty on cold poached salmon) or as a dressing for a chicken salad. Put the yogurt in a small bowl or medium jar with a sealable lid. Add the lemon juice. If using a bowl, whisk them together; if using a jar, screw on the lid and give it a good shake to combine. Peel the garlic (or shallot). Use a garlic press to crush it or, even better, crush it with the side of a large knife, then use that knife to mince the garlic into a paste. Add the garlic to the yogurt mixture. Lay the mint leaves in a stack, putting them flat on top of one another. Roll them up lengthwise into a tight bundle. Use that sharp knife to cut the bundle crosswise. Use your fingers to fluff the resulting cuts apart into ribbons. You can stir these mint ribbons into the dressing as-is, or cut them further into more of a mince for a finer texture. Stir into the dressing. Add salt and pepper to taste. Freshly ground black pepper makes a big difference in this simple dressing, so use it if you have it. Add more lemon juice to thin the dressing to taste, if you like. Give the whole thing a final stir to shake to combine everything. Use the dressing immediately—drizzling it on a fresh lettuce salad or offering it as a dip for crudités—or, make it ahead and store, covered and chilled, for up to three days. * You definitely want un-flavored and un-sweetened yogurt here—anything else will simply ruin everything. Seriously. It's important to note that while the final dressing will be richer, creamier, and tastier if you use whole milk yogurt, the recipe works just fine with low-fat or non-fat yogurt if that's what you have on hand or prefer. 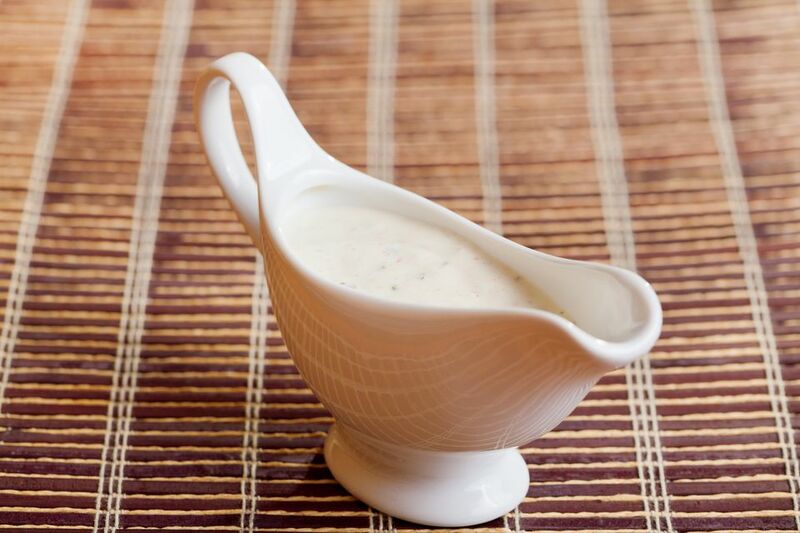 If you choose low-fat or non-fat options, know that the dressing is likely to separate if you hold it. Simply whisk or shake it back together before using.